The walking programme runs from Saturday till Saturday and includes five guided day walks. The accommodation is at country house Landrucci. 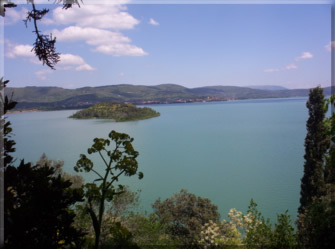 This is situated between the Tuscany hills and the Umbrian mountains, close to Lake Trasimeno. We explore unknown territory of Tuscany and Umbria; sometimes following tracks which even the locals have forgotten about. Despite Tuscany being so well-known, on these tracks in the foot hills of the Apennines you sometimes don't see any tourists. We discover new landscapes and see and hear about local and personal history. The walks are very varied as for nature, atmosphere, culture and history. We walk in the tracks of Hannibal, St. Francis, the Etruscans, the Romans and traditional farm life. You are welcome from 4 pm. If you travel by train, you'll be picked up from the station. The welcome meal is at 7 pm. Upon arrival you can freshen yourself up, jump in the pool, relax on the terrace, or get some supplies in. You can take the bicycle to Terontola but it's also in walking distance. Early evening we walk to the restaurant for a very special and yummy Tuscan welcome meal. 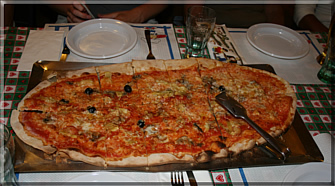 Lucia will tell you about typical eating habits of the Italians. Walking back in the dark you will be enchanted by the thousands of fireflies which at this time of year are flying around the road! Recover from the journey, a guided tour over the lands of Landrucci, a bit of cycling, walking, swimming, or may be a quick visit to Perugia. Landrucci is about 1 mile from Terontola station. From here there is also a bus service to Cortona. In the morning you could also make a short, marked, circular walk via Riccio and Terontola Alta. Late afternoon we will have "olive oil tasting" with bruschetta. Mario, farmer and manager of Landrucci, will tell you about 100 years history of Landrucci in the Val di Chiana. Afterwards we'll make a small walk through the Val di Chiana. Via country tracks through farmland, gardens and vineyards, we walk to Pietraia. You can eat the nicest pizzas of the area here. No doubt we will see many more fireflies on the way back. Lucia starts with a short introducion to the Etrucans. Then we drive with the little bus to two Etruscan tombs. An Italian archeologist will show us the specifics of the tombs and tell us more about the Etruscans in this area. 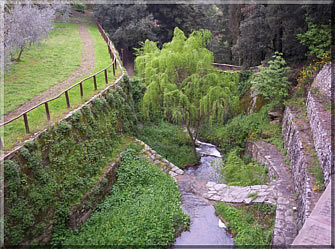 Along the walks we can admire the gardens of a the Medici manor and visit a hidden monastery with a splashing waterfall. Via forgotten forest tracks we arrive at a mountain ridge with views of Umbria and Tuscany in all drections. Depending on maintenance by the farmers, the tracks can be really overgrown. We finish in the little Etruscan city of Cortona. Here you can visit an Etruscan museum, wander around the narrow streets of this Medieval city, or watch and enjoy the promenading from a terrace. The story of Hannibal starts on a hill top with views in all directions (mainly only remembered for his elephants). We walk through the wood where he hid with his troops. We come across Hannibal's spring and can have a coffee at friends of Lucia's, living in a sort of tropical rainforest. The walk and relevant stories allow us to imagine how Hannibal fought this (for the Romans) desastrous battle. A battle with great magnitude for the Roman Empire, and therefore influencing our own history. Continuing our walk over mountain ridges, we enjoy ever changing views of the Val d’Esse, Tuoro valley and Lake Trasimeno. Via a very special olive grove we walk into Tuoro. Here you can walk on to the valley where the actual battle took place. You can take a day's rest, reading books from the library, laze by the pool, go shopping at a typical Italian market, vist Siena or old Perugia with it's underground city. Also Assisi and Arezzo are within easy reach by train. For participants of walking weeks LuciaTours has city walks and information available for a nice day out. 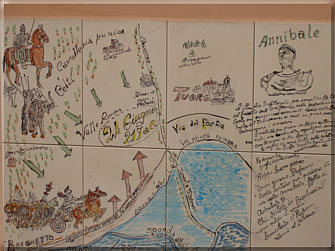 Also various cycle routes are available, for instance to a very special museum. For the tireless walker it is of course possible to make a day walk. This is a walk with loads of climbs and descents. You walk from Lake Trasimeno to the impressive Rocca. With map and route description, this walk can be easily done, without getting lost. We walk in a zigzag through the lovely dale of Val d’Esse. 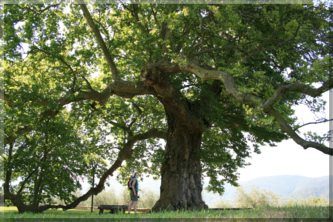 We visit a 15th century feudal garden with the second thickest tree of Italy (6.33 metres) and arrive at the healing water of the Madonna del Bagno. We continue our trek to the last little valley of the old hamlet Valecchie. Here we can cool down at a little romantic waterfall, before starting to climb again towards the source of the Esse, the dead end of Tuscany. After a total of 4-5 hours walking, we arrive at a nature campsite with a very big natural swimming pool. While swimming you can enjoy the stunning view over the mountains. We can stay here as long as we please. For those interested in gardening and ecological forestry, Wilfredo can give you a little guided tour. Wilfredo has lived here in the mountains for well over 20 years, worked with the farmers, and is a fountain of knowledge about the nature, the people and the history of this area. Via an old (overgrown) local track we continue our walk to Miramonte, Lucia's olive grove. In the evening we can have cookery lessons and prepare a meal with the freshly picked vegetables from the allotment. We walk to a summit of over a thousand metres high. (Don't worry, we start at 800 metres). 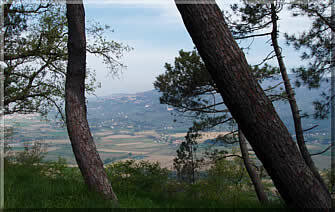 It is the highest mountain in the area with stunning panomaramic views of the Apennines. Descending through a chestnut wood, along the way can can pick blackberries or wild forest strawberries. We take or break in an almost deserted little village. After tasting the nicest spring water of the area (according to the last remaining old villagers) we walk over mountain tracks with little green covered ravines; Lucia’'s favourite valley. This is not a very long walk, so this last day we have some time left to relax, swim, visit Cortona, get an explanation about old-fashioned wine making, or whatever comes up. In case you want a longer walk, you can walk on to Cortona. This can be easily doen with Lucia's route description. It is possible to extend your stay and rent a room or apartment. 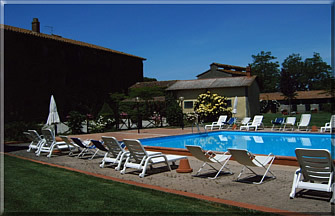 Farm country house Landrucci is an ideal base for all sorts of activities. Would you like more information about the walks, travel or accomodation, e-mail your details to rinus@luciatours.nl or phone +3170 3646012 (Dutch) or +44 1425 617480 (English). The walks are guided by Lucia. She is a Dutch guide, speaks fluent Italian and quite some English. Lucia is experienced in organising and guiding walking trips and treks. She has spent a lot of time in this specific area in Italy, exploring it in depth. This enabled her to carefully lay out the walks and create a very well structured programme. The walks are along the most beautiful tracks, avoiding the tarmac. Lucia has a warm interest in this region. Since 1993 she has lived around the Tuscany-Umbria border and accompanied and guided groups of walkers. She knows the people, the work on the land and the history. For those interested, she gladly will talk about that in her own enthusiastic way. Lucia walks with small groups (from 6 to 9 people). This out of respect for the nature, environment, history, but also because of the co-operation and friendship with the local people. With a small group it is also possible, during the walks, to have the opportunity to focus on personal interests, desires and questions. Because Lucia knows this area like the back of her hand, she offers alternatives for longer or shorter walks and can therefore adjust the programme on the spot. That way everybody can enjoy the flowers, birds, salamanders and other animals for themselves. Lose yourself in the history of this region. Wander around by yourself. Enjoy the magnificent views in silence, or walk through the mountains while having a pleasant chat. Be surprised by the variety of the walks.